Explain the purpose of a map and identify map features. Analyze a variety of maps and identify map features. Describe the methods used to read a map. Explain the five themes of geography. 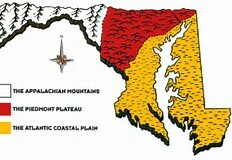 Describe the three geographic regions of Maryland.